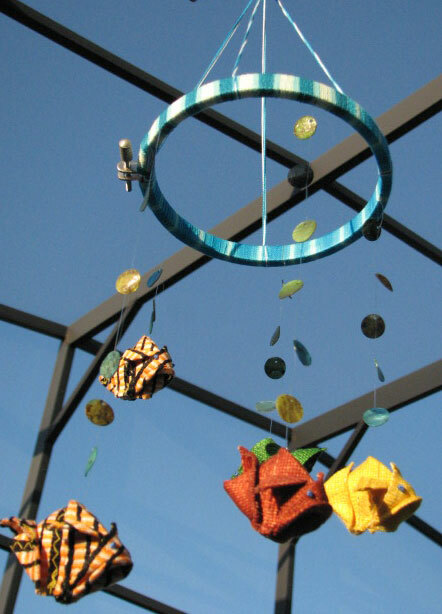 Then it hit me: an inkle origami mobile! 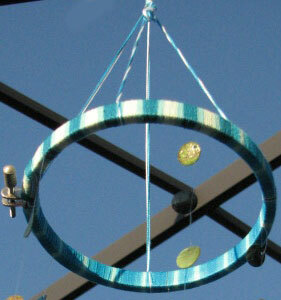 I’ve wanted to make a mobile forever. The fish gave me the perfect opportunity. This project made me very thankful that I have tried so many crafts and am a collector of crafty supplies. 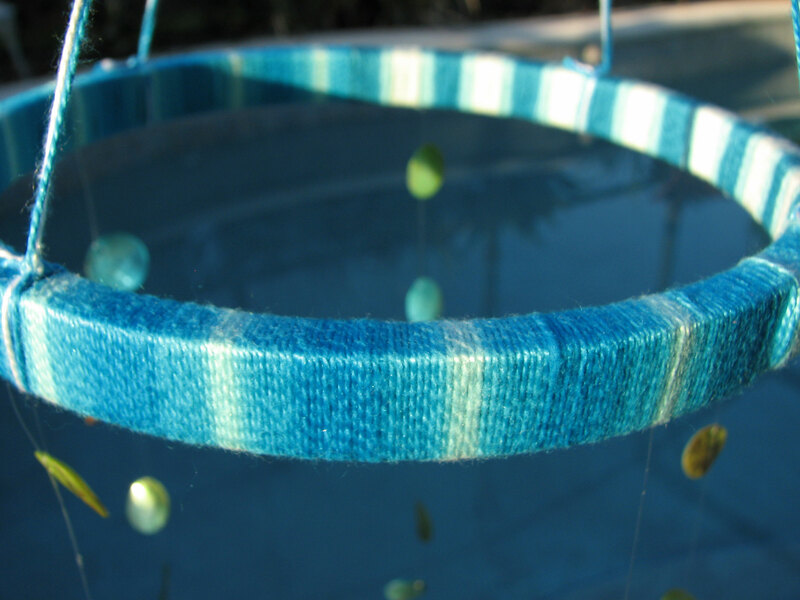 1) Hung the fish from the beading nylon cord and tied them to the inner ring of the embroidery hoop, spaced evenly. 2). Put the hoop back together, catching the tied nylon between the inner and outer hoops, and wrapped the whole hoop with embroidery floss. 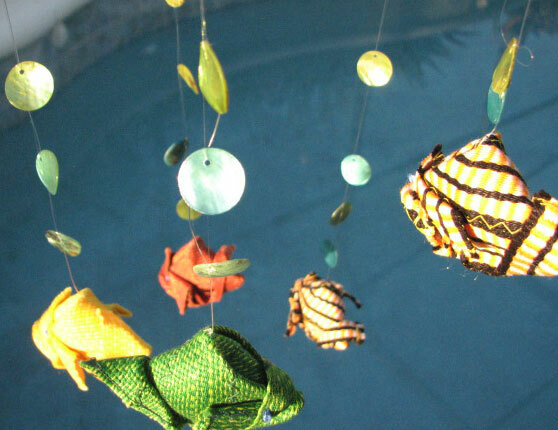 3) Tied the shells to the fish cords with the invisible thread, randomly spaced. 4) Tied 4 lengths of floss to the hoop at the top, spaced evenly, gathered them together so it was level and tied a loop to hang it from. 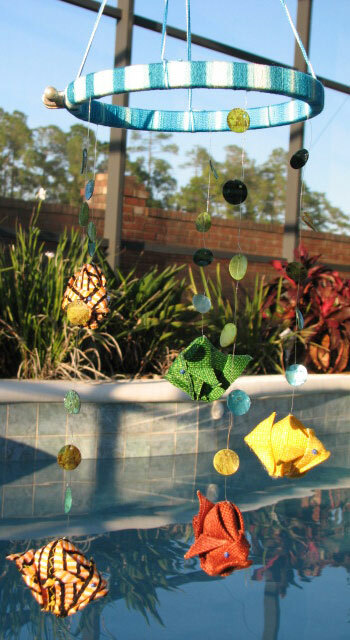 This can be customized so many ways: with more fish, more beads, tassels, hanging the fish evenly or unevenly, or even using a bigger or smaller hoop. Sky’s the limit! Now where to put it? Should it be new décor for our son’s room, or for my creative room? Hmmm. Love the fish out of water!